New words–Polysemy and Synonymy (think of examples in everyday talk, in science, in other subjects. How do you decide which terms to use? Work on Photosynthesis summative–see previous blogposts. Make plans to finish common spreadsheet. Review today’s plan–description of Photosynthesis summative project. Display and explain the basic simplified claim showing the role of water and carbon dioxide and the production of glucose, oxygen, and new water in photosynthetic organisms. Include information about the site of photosynthesis in photosynthetic organisms. Discuss that the simplified claim does not reveal the complex series of reactions involved in photosynthesis. While all the details of these cycles of reactions need not be shown, better projects will mention some of the historical experiments and evidence that have led to understanding of the cycles. due­­­­ beginning of class 12 March. Paper copy and digital copy properly uploaded and shared in DSN. See spreadsheet for this year below. Copy and create a version for your zone (share with editing rights with Dr.F.). Eventually, we will want to consolidate data from all zones. These are the data fields for each tree. Can you think of other information we should add? Show progress on your group’s spreadsheet. Describe each group member’s role. Preparation for Parent Student Teacher conference. Show document with scoring for DSN. Number of entries / Number of classes up to 8 March. Show document with scoring for completeness for each completed entry (from #1 above) Number of items / 7. Show document with scoring for number of substantial or significant reflections included in each entry. A personal statement on how much thought and effort you have put into using the DSN as a tool for learning and growth of understanding. Show essay on Plant Blindness and be ready to discuss what that means with respect to your learning. Be prepared to talk about your partner tree, how your talk to the class went, what you learned from other class members and their talks. How well do you know your partner tree species? Do you recognize it in other places? Describe. Be prepared to discuss and share (pictures, notes, etc.) your experience and learning with flowers, fruits, seeds. Be prepared to discuss the two parts of our semester (now = establishing and experiencing the fact(s) of biodiversity; coming next = learning how scientists explain these facts). Be prepared to discuss the progress and findings (to date) of the tree diversity survey. Discuss how surveys differ from experiments. What challenges did your group overcome and how did they do this? Show your best DSN entries and explain why they are your best. What have you noticed about living things (on campus; elsewhere) so far this semester, that you never noticed before? How have your matured in your learning in science so far this year? Or have you leveled off or regressed? Give examples. How do you keep your effort high? Or has your effort fallen? Give examples. What can you do to make the rest of the year the best in terms of your learning science? What things have you done and what things can you do? Give examples. How many species of trees are on campus? What is the total number of individual trees on campus? What is the diversity index (#species/#trees) for the campus? For each area of the campus? How many plant families are represented by the trees on campus? What is the most abundant plant family? What is most widely distributed species? Which genus is most abundant? Which species is most abundant? Which species are represented by a single specimen? Of the single specimens which would be considered the rarest (need to consult reference for this question)? What is the predominant botanical origin of campus trees? (Native? Asian? Tropical America?) What is the proportion of campus trees that are native (to Aravalli, India, Asia)? How many species would be considered invasive? Which trees appear to have been established naturally (not planted on purpose by humans)? Just using native trees (to India), what is the diversity index for the school and for each area. Just using foreign or exotic species, what is the diversity index for the school and for each area? What related implications for the campus environment do you see? Be sure to consider “environment” from a wide point of view (natural, social, aesthetic, educational, etc.). Which 5 trees are the largest (girth @ 1.5m)? Are they from the same species or the same family? Are they in the same zone of the campus or different zones? Comment on the (scientific) confidence you have in the survey results? What variation do you see across the different databases? What do you think the source(s) of the variation are? Describe how your group collaborated? What challenges did you face? How did you meet those challenges? What could you have done individually and what could you have done as a group to have made your collaboration more efficient and effective? Pick one of the following three questions to answer. Use complete sentences. A. Which trees are currently flowering/fruiting (February 24 -March 9)? Describe the trees, their flowers / fruits? How many other specimens of the same species are also flowering/fruiting? What patterns, if any, do you notice or suspect? Take time for any flowering trees to note insects or birds visiting the flowers. Which animal species visits which tree species? Try to decide if the animal is a pollinator. B. Which trees attract the greatest number of birds? Feeding? Nesting? Roosting? Submit the analysis as a Google doc uploaded and labeled correctly in your DSN AND in print. Be sure your name, period, and date appear on the document. Anticipate Summative project on supporting the claim of photosynthesis. To be described on Wed. Due the following Tuesday by the end of class. Today’s activity provides an experience with a crucial technique in the understanding of photosynthesis. The technique uses the varying solubility of different molecules (the plant pigments) in a solvent. The solvent moves up a strip of paper by capillary action. See reference: < https://water.usgs.gov/edu/capillaryaction.html >.The different molecules move at different rates. Separation is one part of discovering the reaction pathways in complex processes. How did Benson and Calvin separate the molecules involved in the numerous photosynthesis reactions? After separation, analysis is carried out to describe the properties, create models, name, and identify the products of the separation. What do you think are the techniques used for such analysis? In science it is important always to ask–How do we know? The next task is to describe the evidence and to explain how the evidence is linked to claims. Connecting claims with evidence is what is meant by the phrase scientific argument. Your summative assessment on photosynthesis will involve organizing the evidence both from historical experiments and from your own first hand activities, experiences, and experiments and linking the evidence to the (over)simplified claim of photosynthesis. Data that have been analyzed and interpreted in light of an hypothesis, theory, claim become evidence. Follow instructions for the extraction and separation of plant pigments through paper chromatography. See board. Listen closely to verbal instructions. Watch demonstrations of techniques. Follow all safety guidelines. Record all procedures (verbal descriptions, diagrams-sketches, photos). Record all observations. What do Chlorophyll and other pigments have to do with the claim of photosynthesis? What does the technique of paper chromatography have to do with the claim of photosynthesis? Next class we will carry out chromatography on extracts of pigments from plants. See this video in preparation. Be sure to write down your questions. Preview plan for the day in the class blog. 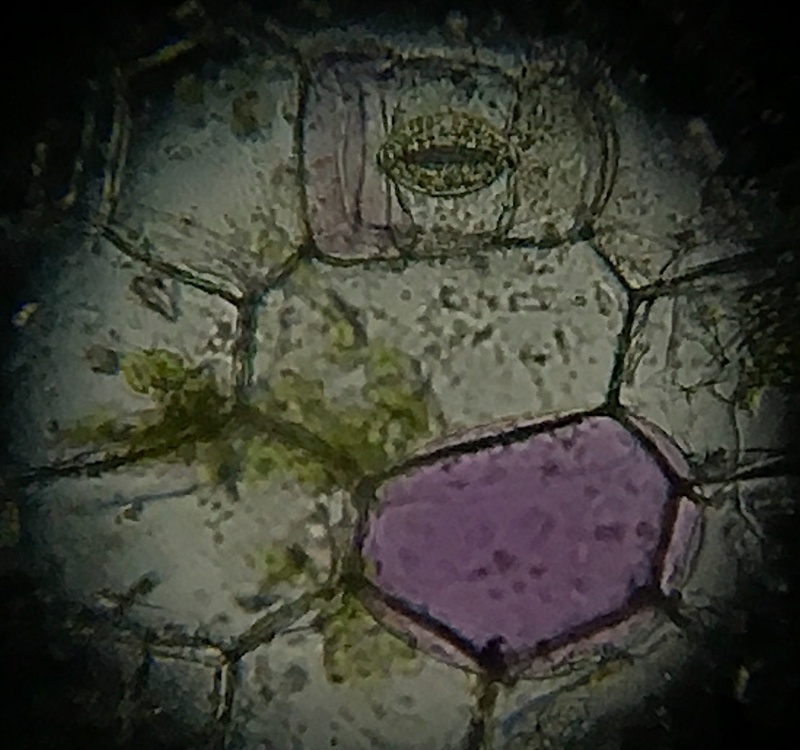 Examination of plant material under the microscope. The purpose is to examine and contemplate the cellular organization of living things. Because green plants carry out photosynthesis, we want to witness first hand the structures that are involved. (Stomata; Chloroplasts, for example.) Remember that photosynthesis takes place in the cells. Taking a sample and making a slide. Directions and demonstration in class. Work carefully and neatly. Clean up as you go. Return supplies to dispensing area clean and dry. Take care with sharp tools. Take care with microscopes. Do not use the highest power unless checked by Dr. F.
Keep water and plant material off the microscope. Do not touch the lenses. Peel from leaf–top and bottom. Look at a section of your leaf–top and bottom. Then you may try to make a peel. Photomicrographs (iphone) above made from leaf peel of Tradescandia in just a few minutes. 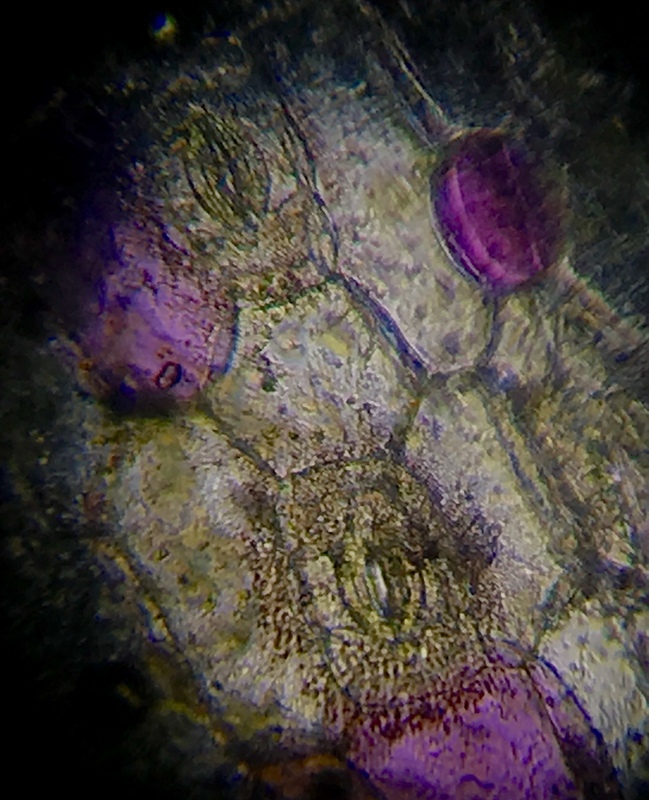 You can make out stomata and the cell structure of the leaf surface. Make sketches to show what you see AND the orientation of the sample from the source. Try to take photos. These should be labelled. If you get a good set, make a pic-collage with captions. Try other plant materials and parts. What can you observe about the cells? Period 3–We will finish looking at species and specimens near Gate 5. Then we will turn to the stretch of Zone 6 that runs along Chandragupta Marg. Everyone in the group needs to have a role in gathering the data and checking the data. No member of either group should be disengaged from the tasks required to complete the data set. Period 4–I will see groups who need help in naming trees. Decide how you will work to complete the spreadsheets for your individual zone. Quickly Read today’s plan in today’s class blog post. Gather 4 leaves. 3 that you covered with black paper and 1 more that has been uncovered. Keep track of which is which. Wear eye protection. Be alert–ethanol is flammable. Submerge the leaves in boiling/near boiling water for 1 minute. Put the leaves in boiling tubes. Cover them with ethanol. Put the tubes in hot water. The mouth of the tubes should be directed AWAY from other people. DO NOT breathe in fumes. We will have the exhaust fans running and possibly have the door open. Keep the water hot enough in the bath so that the ethanol in the tube boils and the green color is extracted from the leaves. When the leaves are colorless, remove them from the ethanol and rinse in cool water. Pour the used (now green) ethanol into designated bottles. Flatten the leaves onto tiles and douse them with iodine solution. Note the results. Take photos. Write your observations and interpretations in your DSN entry for today. Prepare for Parent Student Teacher Conference–we will use this list to have a conversation with your parents. Be prepared!!! Show document with scoring for DSN. Number of entries / Number of classes up through 8 March. Show group presentation on Carbon. Show your early Carbon essay. Show your group illustration about Primo Levi’s story of carbon. Show your von Helmont experiment cartoon. Discuss your role in the skit involving Ingenhousz and Priestly and/or Lavoisier. Show any plant experiments, including the seeds you planted. Discuss the claim of photosynthesis and your approach to gathering evidence in support of the claim–this is the basis of your up-coming summative project. Show your annotated bibliography for the human impact project and discuss your particular topic. Be prepared to discuss the two parts of our semester (now = earth cycles–especially the carbon cycle and up-coming water cycle; coming next = how human activity causes shifts in the great cycles than can disrupt the natural patterns in which natural systems/and human society developed. What are some things you have thought about so far this semester, that you never thought about before? Why do you think Dr. F claims that this semester may be the most important course of your life? How is this 10 year old fighting climate change? Let’s read this poem. It was part of this week’s assignment in an online course from Harvard I am taking on the poetry of earth, sky, and sea. Read entire blog. Ask questions. Then we will begin. Continue with Tree diversity survey. There needs to be descriptions of each kind of tree. Also make note of any remarkable specimens–tallest, greatest girth, active nests, old nests, epiphytes, etc. This data will need to be entered into a class spreadsheet / database. A) Sweep through an area making sure each individual is marked and is assigned to a type (species). If you know the name, use it. If not, use a lettering system (species A, species B, etc.). B) Find each individual specimen of each species and mark on map / count. I will come find each group and take one member of the group through your area and help with names. I can give a scientific name, a common English name, and/or a local name. Or I can show in one of the reference sources. From that you should be able to find information.